My wife, Lisa, does not have a lot of friends on Facebook, although she gets requests all the time, she routinely turns them down. "I don't know these people," she says. "How can they want to be my friend?" I, on the other hand, pretty much accept anyone who asks me. I have no standards, Lisa tells me. I have 4,000 friends, and it is true, I have no idea who most of them are. Sometimes, I never hear from these people again. Most of the time, actually. But every once in a while I will get a plaintive 'Hi' Message from someone in Nigeria or Somalia or Pakistan or some other far flung and unvisited place. God only knows how they find me, or why. When I get these one word messages, I tend to ignore them. I don't know them, and they don't know me. Ali, whoever that was, wanted to come to America. Just ask the more than one million refugees who have come to Europe just this year, many from Syria of course, but many as well from Iraq, Pakistan, Somalia, Libya. 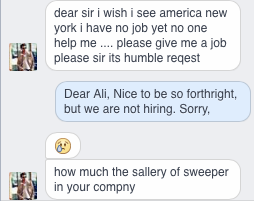 Also, we don't have 'sweepers' in our small company. We don't have many sweepers or helpers in our house either. We have a housekeeper who comes twice a week, but sweepers, no. 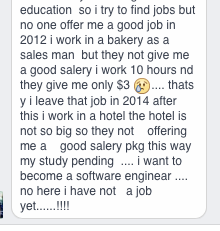 Maybe I was being scammed. Maybe I was wasting my time. Maybe this was no different from the guys in Nigeria who keep telling me that one of my relatives died there and left $5.6 million to me, as his nearest heir. Who knew? I was, however, somewhat sympathetic. Although I have no uncles who went of to live in Nigeria. my great grandmother was also a refugee once. She walked out of her village in the Pale of Settlement on the Polish/Russian border at the age of 17, in 1895. She walked across Europe, on her own, and arrived, finally, in Hamburg, Germany. There she got a job working at a tavern. She worked for a year until she had made enough money to buy a one-way steerage ticket to New York. That was how you changed your life in 1895. I would not be here now had it not been for her tenacity. At least a million people are doing today what my Great Grandmother did more than 100 years ago. Others, apparently, are trying a different approach - social media. There is nothing I can do for Ali. Maybe there is nothing anyone can do. 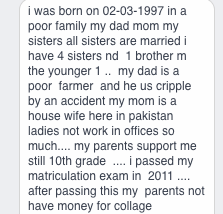 And maybe he is fated to spend the rest of his life working in marginal jobs in Pakistan and never achieve his dream of becoming a software engineer. I cannot say. I can say however, with a great deal of certainty, (having visited the small village my family once lived in), there, but by the grace of God, go I.